This Halloween tune in to COMET TV as they bring you the horror classics that will send shivers down your spine. Before Buffy, before Edward, and before a certain Count, there was "Nosferatu." The classic Vampire film, which is followed by "The Cabinet of Dr. Caligari" and the original "Phantom of the Opera." Sure to send you to another world, COMET TV brings "Space: 1999" and "Babylon 5" back for classic spacey adventures. Everyday you can see "Babylon 5" and "Space: 1999" has back-to-back episodes on Saturday and Sunday evenings. Can’t sleep? COMET TV has the solution with cult classic midnight movies airing Mon - Fri.
Pencil in "Night of the Creeps," get sucked into "Vampires on Bikini Beach" and do your best to escape "The House on Haunted Hill." CHARGE! has the classic series "CHiPs." Join Ponch and Jon as they cruse the freeways of Los Angeles solving crime… Back when you could cruse the freeways of Los Angeles. To usher in the spooky happenings of October we want to give your readers the chance to win he COMET TV and CHARGE! 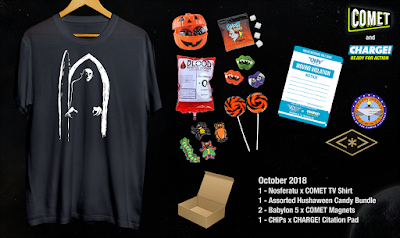 October Prize Pack. 1 - Limited Edition Nosferatu Shirt: Only available via this promotion, this creepy T-Shirt is sure to make your neighbors and friends shriek with envy! AHHHHHHHHH! 1 - COMET TV Blood Bag Water Bottle: I would like some Type-A Negative please. No matter what your flavor, this novelty water bottle is the perfect thing to fill up for an on the go refreshment. 1 - COMET TV Midnight Movies Blood Splattered Candy: Do you have a bit of a sweet tooth? This candy assortment will give you that sugar rush you’re craving! There’s Ghost Poofs, suckers, bugs, lizards and more! 2 - Exclusive CHARGE! CHiPs Ticket Memo Pad: Do you see someone breaking the law and you just have to sound off and tell them? Is someone’s parking THAT bad you want to be like… Dude come on? Now’s your chance! Write them a little note, and maybe mention that CHiPs is heading to CHARGE! as well! To enter you must be subscribed to my YouTube channel: Thisfunktional and follow instagram.com/Thisfunktional and email me your full name and mailing address with the subject line #ThisfunktionalContest #CometTV to Thisfunktional@Gmail.com. Disclaimer: Winners will be chosen randomly. Contest runs to October 31, 2018 11:59 p.m. PST. No purchase necessary. Prize provided by COMET & CHARGE. Only open to the U.S., no PO Boxes or international addresses. Only one entry per household. Entries on behalf of another person will not be accepted and joint submissions are not allowed. We will not accept entries of contestants who have claimed a prize in the last 6 months. New on COMET in October! Creator J. Michael Straczynski's ambitious and complex futuristic space opera charts five years in the lives of those aboard the titular 5-mile-long space station, where personal drama plays out against a tense political backdrop of looming war between bitter enemies the Centauri and the Narn. So you can’t sleep? COMET TV has the solution with cult classic midnight movies airing Mon - Fri! You can pencil in Night of the Creeps, get sucked into Vampires on Bikini Beach and do your best to escape The House on Haunted Hill! You've heard of Carrie White, haven't you? Well, don’t worry because she’s not here in the sequel to the classic, instead we get Rachel who inconceivably is Carrie White’s half sister. And… She’s also telekinetic! Say wha? It’s up to Sue Snell to try and save her from succumbing to Carrie White’s fate! An estranged family finds redemption in the unlikeliest of places: the MMA ring. 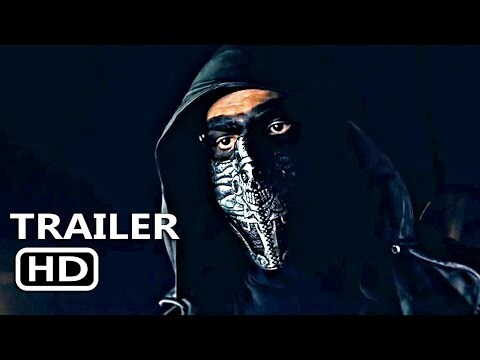 Tommy (Tom Hardy), an ex-Marine with a tragic past, returns home and enlists his father (Nick Nolte), a recovering alcoholic and former wrestling coach, to train him for "Sparta," the biggest MMA tournament ever held. But when Tommy's underdog brother, Brendan (Joel Edgerton), fights his way into the tournament, the two brothers must finally confront each other and the forces that pulled them apart.